Offices of varying sizes available in this fully serviced, modern Business Centre. Fully equipped with furnishings, telephone and internet, to suit companies' individual needs. Nearby professional meeting rooms also available. Fully flexible, for occupation from 1 month to 5 years and the opportunity to move to bigger or smaller offices on the premises. Located six miles from the city centre, next to the city by-pass, providing excellent transport links to the motorway and the A1. 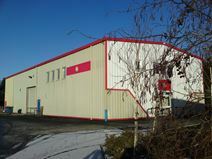 The space is located just outside of Loanhead, around 10 miles away from the city of Edinburgh. Nearby, there are a range of supermarkets, as well as a retail park which also offers food outlets Poddington's Coffee House and Frankie & Benny's. On-site there is a large furnished suite and amenities such as kitchen facilities and 24-hour access. There is a railway station, Eskbank, which runs services into Edinburgh.